MOSCOW, Russia -- Revival of Czarist-era term for ‘New Russia’ fades ahead of European decision on sanctions. 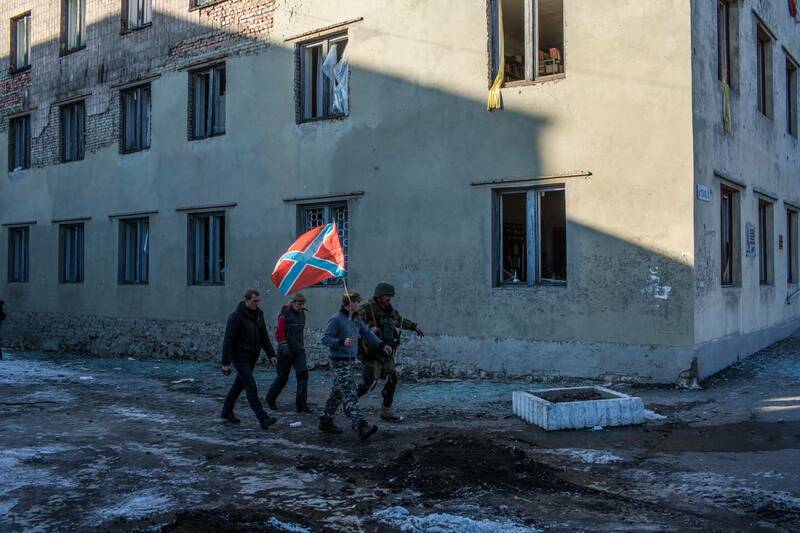 Pro-Russian rebels carry the flag of Novorossiya, or New Russia, past a damaged building in the strategic town of Debaltseve after Ukrainian forces withdrew in February. When Vladimir Putin first mentioned Novorossiya over a year ago, alarm bells went off in the Ukrainian capital of Kiev. The czarist-era term, which means New Russia, refers to a large swath of modern-day Ukraine that Catherine the Great won from the Ottomans and Cossacks at the end of the 18th century. Hearing it from the Russian president in April 2014 reinforced fears that Moscow’s designs on its neighbor extended beyond the Crimean peninsula and across Ukraine’s southern shores to Odessa. But now, as abruptly as the Novorossiya movement appeared, it has begun to fade. Putin has stopped using the term. More modest borders for the Russia-backed rebel republics in eastern Ukraine have begun settling into place. The word is heard less and less on Russian state television. Oleg Tsaryov, a separatist politician who became the frontman for the movement on Russian television, announced this month that the Novorossiya parliament he proclaimed to unite Ukraine’s rebel regions had suspended operations. His reason: The project violates the cease-fire agreement Putin helped to broker. It is unclear whether such signs signal a real shift in Kremlin policy or mark a temporary bid to relax tensions ahead of a likely June decision by the European Union on whether to renew sanctions against Russia. So far, Russia’s negotiating partners in the West appear skeptical that any change is substantive. A year ago, what appeared to be a mild thaw in relations arose ahead of a summit in France, where world leaders made their first attempt to broker peaceful relations between Putin and Ukrainian President Petro Poroshenko. But Moscow’s rhetoric turned cold soon after and fighting reignited in eastern Ukraine. Moscow has shown no sign lately of easing support for the separatists there, much less returning Crimea, which it formally annexed in March 2014. Yet the Kremlin has sent other, modest signs of a softening approach to the West, as Russia copes with a deepening recession at home. This month, Putin met U.S. Secretary of State John Kerry on Russian soil for the first time in two years. The Russian president also called to congratulate U.K. Prime Minister David Cameron on his re-election, during which he expressed Russia’s willingness to help counter Islamic State in the Middle East. On Tuesday, Deputy Security Council Secretary Yevgeny Lukyanov said Moscow was open to cooperation with the West on global security issues. Foreign Minister Sergei Lavrov also has emphasized that the rebel Donetsk and Luhansk republics should be reintegrated into Ukraine. “There’s a desire to show the West that Russia is subtly limiting its game in Ukraine and localizing it to Donetsk and Luhansk,” says Alexei Makarkin, deputy director of the Moscow-based political consultancy Center for Political Technologies. Those rebel states have entered a period of consolidation, according to Makarkin, who says Russia ultimately hopes to keep them integrated with Ukraine as levers of influence over Kiev. European officials caution that they believe the Kremlin’s goal of seeking to block Ukraine’s reorientation toward the West by maintaining a low-level conflict hasn’t changed, and that Moscow could back military escalation if Russia fails to achieve desired results politically. There are few signs the EU is prepared to ease sanctions next month, nor to ramp them up, suggesting a continuation of the status quo. Even if the shift in Kremlin rhetoric lasts, the pattern of behavior on the ground in east Ukraine has shown little sign of change. “Unfortunately, there’s too much combustible kindling on the ground in Donbas as we head into the summer season, which last year was a time of heavy fighting,” said Andrew S. Weiss, a vice president at the Carnegie Endowment for International Peace. A senior Obama administration official said evidence of Russia’s intentions will be whether substantive progress is made to implement the February peace plan, including a local cease-fire for Shyrokyne, near the government-held port city of Mariupol, and movement toward elections. The next round of ground-level talks are set for Tuesday and “we will be watching those very closely,” the official said. Putin’s use of the Novorossiya term endowed the separatist cause with a sense of historical legitimacy and rallied Russian nationalists and revanchists on the battlefield. In the de facto rebel states, separatist officials still hang the revived red and blue Novorossiya flag alongside their own new ones. 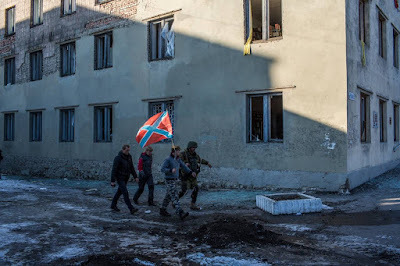 The idea of Novorossiya “cannot be frozen, and to some degree has already been accomplished,” Tsaryov, the separatist politician, said in a phone interview. Alexander Kofman, the foreign minister of the self-proclaimed Donetsk People’s Republic, suggested that the curtailment of the parliament project signaled a rollback of efforts to spread separatist fervor outside the existing rebel areas. “We will be waiting for the other regions to rise up and follow our lead,” Kofman said a week ago on the Russian network LifeNews, in a noted shift from more-bellicose past statements. In a May 15 blog post, Tsaryov, 44 years old, suggested now was the time for consolidation. The only way to turn Ukraine as a whole toward Russia is to create a standard of living in the rebel-held regions, known collectively as Donbas, that exceeds the rest of Ukraine, he wrote. For now, people in government-held areas view Donbas with trepidation, he suggested. “Today the southeast of Ukraine is afraid of a repeat of the fate of Donbas,” he wrote.